How would you feel if you could wake up tomorrow, feeling good about your weight? Enjoy being healthy and proud of your decision to HAVE A SLIM, TRIM BODY forever. Your subconscious mind has the power to end your struggle with food. Hypnosis can change the way you think about food, stops the struggle, and makes you love exercise! Stop self sabotage, and easily release the fat! Discover the power you have to change the way you feel about food forever. Are you tired of trying to make behavioral changes using your conscious mind? Your habits lie in your subconscious mind, so you must change your habits there, and hypnosis is the best way to make those changes. One of the secrets of success with hypnosis is reinforcement through repetition--the way you learned your habits to begin with! Listen to this recording every day, and in just a short time, you'll be amazed at the changes you see. Hypnosis will affect the way your brain feels about food, emotional hunger, cravings, and your beliefs about your body. "Lose Weight With Hypnosis" recording . It focuses on improving your relationship with your Self while changing your relationship with food. YOU WILL Make better choices, eat more slowly and exercise more, naturally. This Dr Janet Hall hypnotherapy audio implants positive, healthy behaviors in your food and beverage choices, and in your motivation to move your body. These are the foundations for success with any weight loss or fitness goal, and so this audio can be used in combination with any healthy eating plan or exercise program to enhance results. You can finally LET GO of "dieting" once and for all and start LIVING your life, the way you were meant to from the beginning--loving who you are! Be in control, love to eat nutritious foods. Easily turn down the sweets and fats. It is all in your mind. Hypnosis is the answer. Weight loss is achieved faster with hypnosis. Some people say it feels like magic because it is so easy to make powerful changes. Hypnotherapy allows you to access the resources you already have in your subconscious mind. 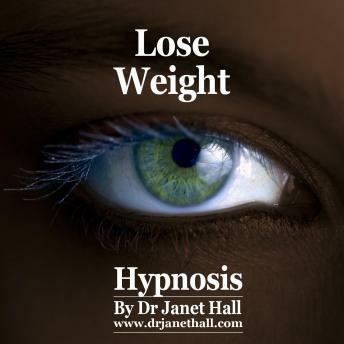 So, if you're serious about being your ideal weight, then you need to get a copy of Dr Janet Hall's "Lose Weight With Hypnosis" right now!